It is the end of summer, and what better way to celebrate than to make pickles?! I love pickles. Like, really love them. The sourness with the salt and a bit of crunch. Ohh, man! When we lived in Maine we had a garden and I would make pickles pretty often as I always planted a way too many cucumber plans. Or so I thought, until my pickles ran out. I also love to pickle green beans and beets. Other crisp vegetables such as carrots and cauliflower also work well as a pickle. Depending on how fast you want to eat your pickles will change how you cut them. Usually to make cucumber pickles I cut the cucumbers into spears. They should pickle for at least a week and will last several months in the refrigerator. For these beet pickles they are ready in about an hour and will last a few months in the refrigerator. 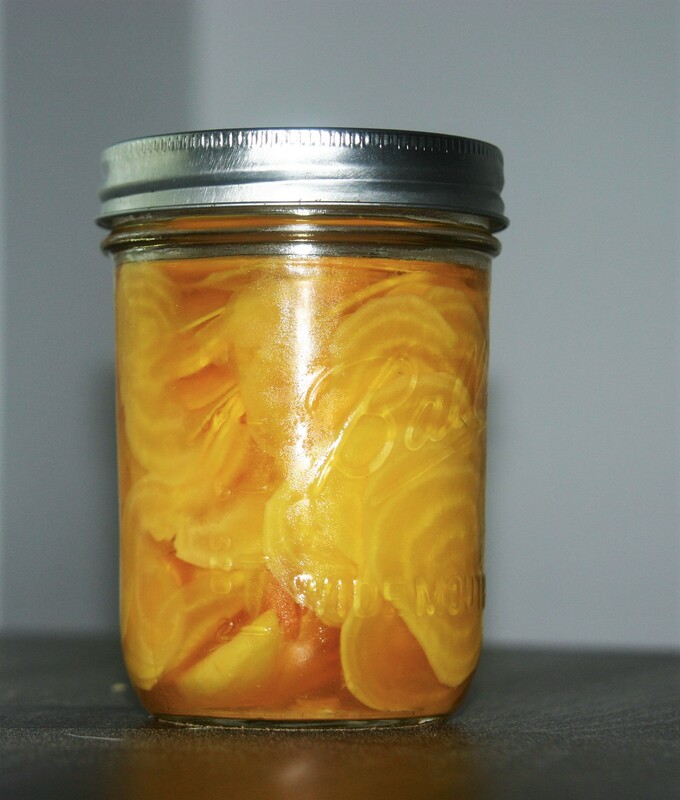 You must refrigerate these pickles as they have not been sterilized through a boiling process like some recipes for canning pickles. I suggest eating these straight from the jar, or topping your favorite sandwich with them. Ohh, yum. Makes 1-2 pint jars of pickles depending on how many vegetables you use. Recipe is easily doubled or halved. several sprigs of dill (per jar) – I didn’t use this with the beet pickles, but you could. Heat vinegars, water, salt and sugar together until just starting to simmer. In sterile jars place crushed red pepper, peppercorns, garlic, and dill. Pour hot pickling liquid over the top to cover vegetables. Place lids on jars and finger tighten rings. Let cool to room temperature, then store in the refrigerator.